The Golden Vale is a picturesque region of rolling hills and pasture land in southwestern Ireland spanning three counties — Limerick, Tipperary, and Cork. Tipperary Distillery is a brand-spank’in new operation that sits in the middle of this small patch of God’s country. Founded in 2016, their own distillery is under construction. But until then they are contracting out to other boutique distilleries in the region to supply them with their first signature spirits, of which, currently there are three: The Rising, Watershed, and Knockmealdowns. 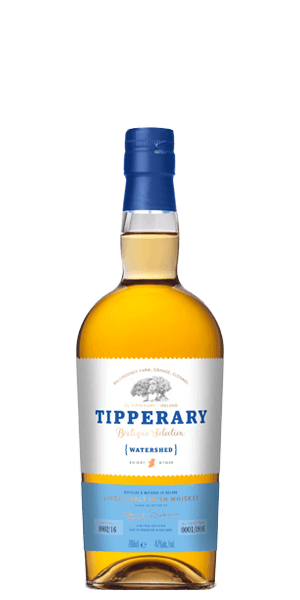 Being a small operator — a boutique distillery — just about everything that they do is “limited.” For Tipperary Watershed Boutique Selection Single Malt Irish Whiskey, each release is limited to six casks. Each one is a first-fill ex-Bourbon barrel filled with premium Irish Whiskey selected by Malt Master Stuart Nickerson. The spirit is cut to a spot-on 47% ABV with local spring water and each bottle is individually hand-numbered. And we do not detect a single artificial coloring or nasty additive has been within twenty miles of this lovely dram. What does Tipperary Watershed Boutique Selection taste like? The Flavour Spiral™ shows the most common flavours that you'll taste in Tipperary Watershed Boutique Selection and gives you a chance to have a taste of it before actually tasting it. It is a very good, delicate, Single Malt Irish Whiskey with a delicate birth; while a balanced life leads to a smooth, warming, & buttery death with hints o f grape & honey. This is pretty harsh. Not for me. Strong vanilla nose, but not indicative of the taste. Strong notes apple, very floral. Solid. The mix of softer flavors upfront with a creamy mouthfeel contrasts the spicier finish. Very nice. Not what I expected from an Irish. Aromas of fruit and honey. A pleasant spice and more fruit while sipping and a long, pleasant, sweet finish. Pleasant surprised. A little mild for me, but I could see myself drinking this again. I am really enjoying this sample. It's full of mostly sweet flavors but it's got some heat to it with the black pepper. I wouldn't call it smooth, exactly, but it is enjoyable. A lot of character for an Irish whiskey! Good smell, sweet with flavors of vanilla, apple, honey, peppery, medium finish. Good dessert supper if you want something lighter that won’t hit you hard. Good easy sipper. Super fruity, sweet and very smooth. More of a peat guy myself but this would make a great dessert whiskey! Not bad for an Irish whiskey. Smells a little better than it tastes. Quite nice for an Irish. Pretty good. Spicy and peppery at the start, but finishes with a taste of vanilla and apple which lingers for a while. Tired this as part of the Advent Calendar. Was decent. Sweet and smooth. Not something I would rush off to buy though. One of the better Irish whiskys I’ve tried. An interesting mix of sweet and spicy, but in the end it was just ok.
Great for mixing. Wonderful with a lime and ginger ale!